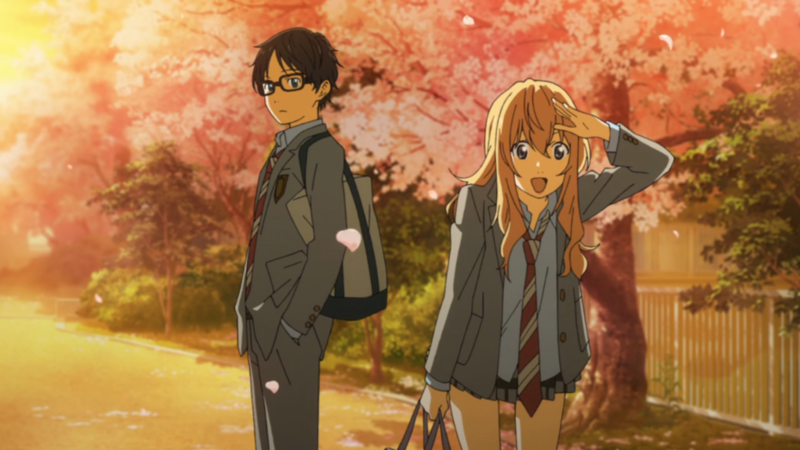 With fortuitous timing, the concluding half of Your Lie in April comes soon after A Silent Voice brought a wider audience to a side of anime once neglected; the emotional, even tragic, real-world teen drama. Once again, it’s about a boy and a girl with deep problems; about how they awaken huge potential in one another; and about the fight between light and dark in their everyday lives. If you’ve not seen the first volume, Your Lie in April is about a boy, Kousei, who’s a piano prodigy tortured by the loss of his mother. It’s also about Kaori, the relentlessly buoyant girl violinist determined to break Kousei out of his shell by any means. While the series had a far lighter-seeming opening than A Silent Voice, with many goofy gags, it soon got heavy. We plunged into the depths of Kousei’s psyche – almost literally, as he imagines playing the piano as being trapped on an ocean floor. At the same time, the lad is progressing. Kaori, for instance, notes that Kousei doesn’t look down at the ground any more. But it’s in its second half that the series gets really heavy. You can’t say you weren’t warned. There were plenty of clues to where the show was going, most obviously with Kaori’s spell in hospital early in the series. Early in volume 2… something bad happens. It has Kousei struggling to cope with his worst crisis since he lost his mother. It also hits other people in his life, especially his childhood friend Tsubaki, who’s already struggling with the realisation that she sees Kousei as more than the shrimp kid from kindergarten. It’s a painful, emotionally blocked situation – comparable, again, to some developments in Silent Voice. Your Lie in April is markedly different from Voice, of course, not least because it can accommodate much more story in its 22 episodes than Voice could in a feature. Like Voice, Lie is based on a lengthy manga, serialised in a boys’ magazine, despite emotional content that might stereotypically suggest girls’ fare. Both Voice and Lie ran in magazines published by Kodansha. Voice ran in the company’s Weekly Shonen Magazine (more on it here), while Lie ran in Monthly Shonen Magazine. The strips overlapped in the 2010s, though Lie ran longer (2011 to 2015), because of its monthly release and because it filled eleven volumes to Voice’s seven. Indeed, the performances punctuate Lie like battles in a fight anime, or else the time-distorting matches in sports shows from Star of the Giants to Ping Pong The Animation. In Your Lie in April, the piano keyboard is an inescapable black hole for Kousei, but then a realm of blinding, cathartic realisations, a place to find identities and save souls – and not just Kousei’s. There had been music sagas in manga before. When Lie began serialisation, Monthly Shonen Jump had recently finished Beck, Takahiro Sakuishi’s opus about a rock band, which was why Arakawa based Lie around classical music. Another difference: Beck is centred around boys. Lie, though, places a boy between two girls in a quasi-love triangle (though it’s more complicated than that, and Kousei’s too dense to realise anyway). Andrew Osmond is the author of 100 Animated Feature Films. Your Lie in April, part two, is released in the UK by Anime Limited.